On Fridays… we “shhhh” the inner critic and run freely with our words. Allowing ourselves to exercise our free-flowing words with a one word prompt from our fearless community leader Lisa Jo Baker. Then we join together and encourage each other – kind of like a Flashmob for Writers. Recently I added two new friends to my Facebook page … friends from middle school. One remembered me and the other had some vague familiarity of my name. Many people who know me well know that I have friends all over the country and a few overseas. They are all a part of my life because I have lived in many places…. and in order to keep in touch with them I have used snail mail, email, then Facebook – which really expanded my capabilities of finding a few friends that I had lost touch with many decades ago. Basically it encourages you to walk away from the people in your life who are negative, or who drag you down … but I believe eventually we would all be ALONE if we followed that advice. I have friends of all kinds … They all have distinct personalities and opinions and their own personal soapboxes that they stand on in life… Sometimes I join them on that soapbox, other times I just read or listen to whatever they are passionate about. Not everything they say is nice, or beneficial, but I can’t discount them as a friend simply on the merit that I think they are “negative” … each one brings a little piece of something to my life. Honestly? A few years ago someone said something to me that was pretty negative and I was really at a loss for words. It hurt, and it hurt deep. I had COMPLETELY lost sight of my own sinful nature. I could have easily let that person go, but I was taught a valuable lesson that day. An important lesson that I try to exercise daily. 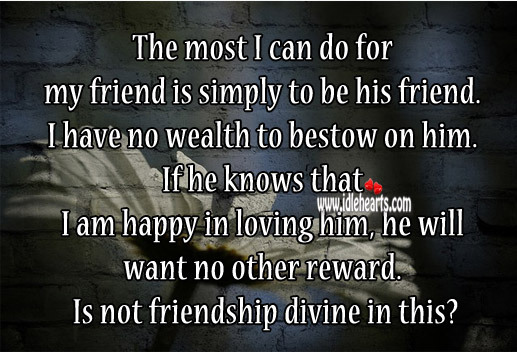 A good reminder of what being a true friend is about. Thanks! Excellent! I love the idea that each friend adds something to our lives, and your words have added to mine. Thank you.